Discussion in 'Land Use Issues, Where To Ride' started by Visser, Sep 3, 2018. Okay, actually between Horning Mills and Kilgorie. You still do... but now there is a fresh new gate and a sign saying that area belongs to the Pine River Provincial Fishing Area (PRPFA) with no motorized vehicles allowed. The road allowance for 2 Line W is still open though, although a bit muddy. The problem is, there is no sign for the boundary of the PRPFA when you are South bound from Side Road 15, so I am not sure when exactly your riding becomes illegal if you take that route. 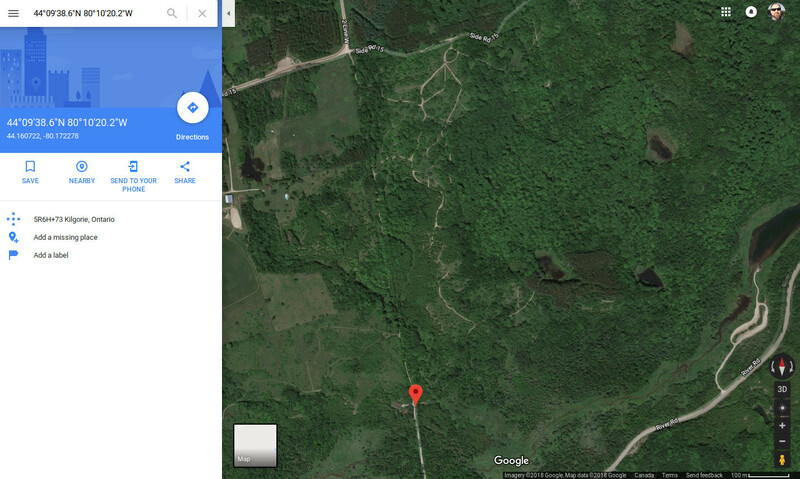 This very fuzzy image taken from google maps seems to indicate that the North boundary of the PRPFA is roughly at the end of the maintained portion of 2 Line W, which would mean that trail essentially follows the boundary for a little bit. Also, the lookout seems to be very often jeep ridden now-a-days. The 'trails' are like roads themselves. I'm not complaining, and personally don't care if jeep guys use it. I just hope something doesn't happen there as a result of it becoming too popular and being locked down and gated up, which is apparently starting, at least to the South side. Anyway, just an FYI, as I didn't realize I was in a provincially protected area until I came to the back side of a gate that was never there before. I don't know, but I suspect that one day that area will be shut down as the massive bare trails lead to a lot of erosion during heavy rainfalls with no vegetation remaining, and all that dirt will eventually get washed into the fishing habitat they wish to protect. If you haven't been there in awhile, the trails really are getting huge. 10' across in some areas with massive washouts developing every time it rains. Looking at the satellite imagery though, I still don't think these trails will pollute the marsh in that area, but I would not be surprised if that is the excuse environmentalists give. Most of the jeep trails are far to the North near road 15. Also, if the admin thinks it is necessary to move this post to a section of the website that is not searchable or visible to the general public so this area becomes even more popular, I'm good with that even if I can no longer see it then... I just wanted to bring this info to light. And to the OFTR guys... I wonder if it is worth looking into trying to get a land use agreement regarding this area before it is eventually just shut off to everyone? Thanks for letting us know Visser. This is very bad news indeed. This is really unfortunate. This was my frequent stop on the return leg of the usual 'Creemore run' although I haven;t been that way all summer it seems. I think we need a real 'trail maintenance' program from OFTR that addresses not only downed foliage but also issues like erosion, etc... I'd happily pinch in $20-30 and make time available to lug a few bags of top-soil to help re-cover some of the widening tracks, plant small trees, whatever, around lookout and other similar areas just to ensure the enviro groups are happy with us. Having 20 riders show up (some with an ATVs to lug the crap up) would make for a good day out in the bush and keep the riding areas accessible... local businesses won't turn down $600-1000 in soil/plant purchases and should offer a discount to help make the most of the money. ThatGuyDuncan and taylorericjohn like this. I'd volunteer for such a project in any of the nearby areas (lookout, Scorra tracks, whatever), and I have an ATV that could help with the heavy lifting. I don't normally ATV down here, I am a member of HATVA so I always bring it North, but if there was a project to work on I'd help out. I believe all that land by the lookout is now privately owned. If I’m correct, it is an aggregate company that purchased it. I don’t think working on the trails will yield much benefit. This is a very popular spot for locals with their quads and dirt bikes. Pretty sure the 4wd trucks and jeeps are in there too. Update from a bud who went riding towards this region today...all posted for "no entry". I haven't seen the signs nor the extent of it all myself. I actually live in Mulmur Township and frequent this area a fair bit, but have not seen any signs posted. This must be just recent and I'm going to take a ride out there myself to have a look. Personally I often wondered how long this area would be open as was mentioned above it has become very popular especially for jeep riders. 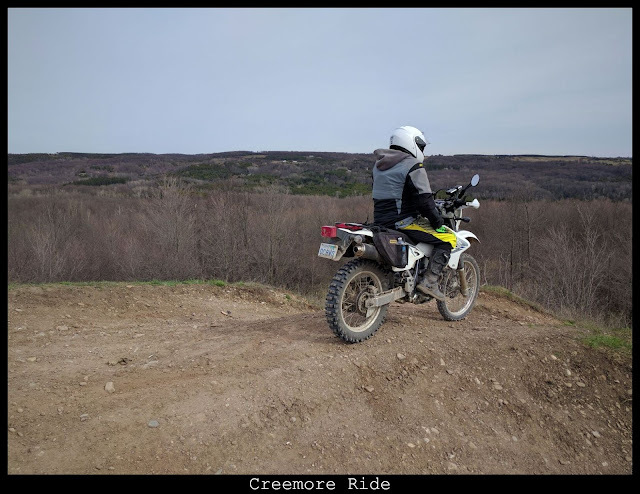 Mulmur Township does allow atv riders on the back roads and that area is always active on the weekends. The park is just to the south east of the view and a lake at the bottom with access from The River Rd. I think what has happened here is riders of all types, bikes, atvs and jeeps have been riding in the bush just east of the view and actually entering the park land not knowing the boundary. Hence the reason signs have appeared or is it because the area is now private? Will check it out this weekend. Looks like Mike is right. I rode yesterday to the area to have a look and there is now new gates in place off 2nd line north off the River Rd. The gate closes the trail when turning right from 2nd line to make your way up to the view. You can still ride strait up 2nd line which meets the 15th side road as this is also a snow mobile trail in winter (there is a section of this trail half way up which is pretty boggy and wet). A new gate also blocks the access road which takes you down to the lake when entering the park from River Rd. Surprisingly you can still access the view at the top from of 15th side rd, but I wonder how for how long? I think they will close that access point as well. From reading the sign, the ministry of natural resources has taken over the park to restart a fish restocking program in the lake. This was done many years ago by the ministry and abandoned, now they have restarted the program again. I saw a thread for a Jeep club doing a charity event that went threw here a few weeks ago. I was not with them but I heard it was a big group.